Kim Horn has been performing and teaching music for over 20 years. She earned her Bachelor's Degree in Music Performance on the flute with a jazz studies minor on the saxophone from DePauw University in Indiana. She teaches flute, saxophone, clarinet, and piano for Music and Arts. Her biggest mentors and teachers throughout her life have been Anne Reynold (of the Indianapolis Chamber Orchestra and DePauw faculty), Rebecca Arrensen (of the Indianapolis Symphony Orchestra), and Randy Salman (Belushi-Wallarab Jazz Orchestra and DePauw faculty). 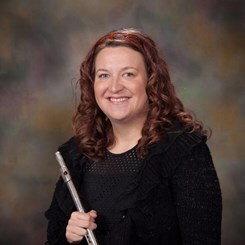 She performs regularly with the Canyon Winds Concert Band in Colorado Springs and has also been involved in the Pikes Peak Flute Choir in the past. Her students come from all around the Littleton and highlands ranch area, schools such Deer Creek Middle School, Goddard Middle School, Ken Caryl Middle School & Columbine High School. Request Lessons with Kimberly today!